Create an unforgettable selection of prizes for a promotion run by Shell garages, in conjunction with Costa. We were tasked to come up with a tiered range of prizes, from luxury holidays to lower-value products and vouchers. 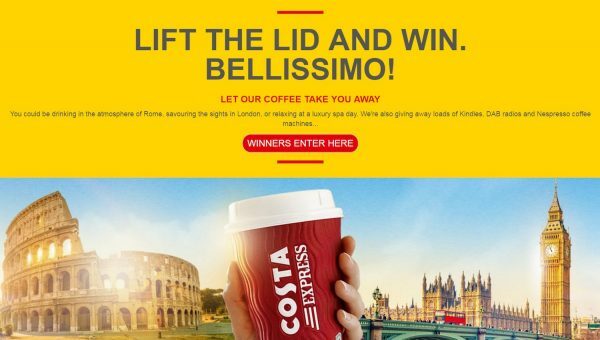 Keeping the theme of coffee at the heart of the campaign, we organised ten luxury holidays to Rome, complete with an espresso and gelato tasting tour for each winner to enjoy. These were supported by runner-up prizes including coffee tours in London, luxury spa days, Nespresso coffee machines, Kindle e-readers, DAB radios and three-month magazine subscriptions. With over 1,000 prizes given away throughout the campaign, we were delighted to hear from lots of very happy winners! Want to find out more? Get in touch via email or give us a call on +44 (0)20 8871 9959. I just want to say how much I enjoy working with you, you just get what I need!